The government reported Friday that more than 240,000 lost their jobs in October as the unemployment rate rose to 6.5 percent. 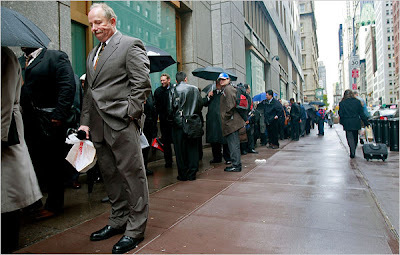 Above, jobseekers lined up last last month for a career fair sponsored by the I.R.S. clearly, the u.s. economy is seriously ailing. since august, the economy has lost 651,000 jobs, making it 1.2 million jobs lost this year. what's worse is the economy must produce 150,000 jobs per month, just to keep up with the new workers who naturally enter into the workforce. the reality is, no matter what people expect from president obama in the coming months and years, these problems are here to stay for a good while. there is no quick fix. but there is a way out: through smart, solid and well executed federal policies that will be provided by the soon-to-be-inaugurated obama administration. the u.s. will work through this. there are still 74 days left before obama takes the helm. We expect the employment data to be dreadful for many months to come and consequently for consumer spending to continue to decline. The U.S. consumer, which for so many years was the global engine of growth, is now the world economy’s achilles heel. –Joshua Shapiro, MFR Inc.